от 250 шт. — 17.70 руб. 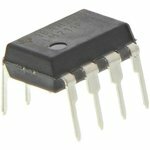 The LM111, LM211 and LM311 from Texas Instruments are differential input voltage comparators with a wide operating voltage range and 200 ns response time. The inputs of these devices can be isolated from system ground and the uncommitted outputs can drive loads referred to either supply rail or ground. These single comparators are provided with balancing and strobe capability.